This book constitutes the first major exploration of HBO's current programming, examined in the context of the transformation of American television and global society. With studies of well-known shows such as Game of Thrones, Girls, Insecure, Looking, Silicon Valley, The Comeback, The Leftovers, True Detective and Veep and Vinyl, the authors examine the trends in current programming, including the rise of queer characters, era-defining comedy, reinvented fantasy series, and the content’s new awareness of gender, sexuality and family dysfunction. 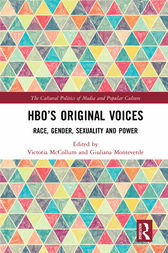 Interdisciplinary and international in scope, HBO’s New and Original Voices explores the sociocultural and political role and impact that HBO's current programmes have held and the ways in which it has translated and reinterpreted social discourses into its own televisual language. A significant intervention in television studies, media studies and cultural studies, this book illuminates the emergence of a new era of culturally relevant television that fans, students, and researchers will find lively, accessible and fascinating. Dr Victoria McCollum is a Lecturer in Cinematic Arts, in the School of Arts and Humanities, at Ulster University (Northern Ireland). Her most recent research examines how horror films, including some of its most transgressive subgenres, deal with memory, ideology, and the often competing claims of nationalism, American exceptionalism and cultural sorrow. She is the author of Post-9/11 Heartland Horror: Rural Horror Films in an Era of Urban Terrorism and is currently working on a new edited collection entitled, Make America Hate Again: Trump-Era Horror and the Politics of Fear. Dr Giuliana Monteverde is a Lecturer in Media Studies, in the School of Communication and Media, at Ulster University (Northern Ireland). Her most recent research revolves around representations of complicity in contemporary feminist discourse, looking at, amongst others, Sheryl Sandberg, Miley Cyrus, and the Kardashian klan. Giuliana contributed a chapter to Complicity: Concepts and Case Studies (2016), and has published articles in The Journal of International Women’s Studies and Critical Studies in Fashion & Beauty. She is currently working on an article for Gender, Work and Organization, and a book chapter on The Handmaid’s Tale.